There's nothing special about today's outfit, but I was having a conversation with some fellow blogging babes last week about finding new outfits for our blogs, and using the same clothes for outfit posts. I think sometimes as a blogger and for me just every day, I feel certain amount of pressure to wear something new or something that hasn't been seen before. But I think what is important is to remember is that blogs like mine serve as inspiration and it's more about how to put things together than being just a rounded, chubby coat hanger. It's also important to remember that I, like most people out there, don't live the sort of lives where you need to be dolled up to the nines, or wearing uber trendy stuff every day, so I want to make sure I'm not only posting aspirational stuff (which is nice) but I'm posting obtainable stuff too. I want you to click the close button from here and think "I could wear that" or "I have those things in my wardrobe". As you might be able to tell from the title and these ridiculous pictures it was a tad windy today! So no, it's nothing special, but as Monday is our designated family day, we were headed to a local museum so I wanted to be comfortable, yet stylish. I think the feeling conveyed by this pic is "Oh FFS"
I decided to wear these PU panel leggings from The Curve. 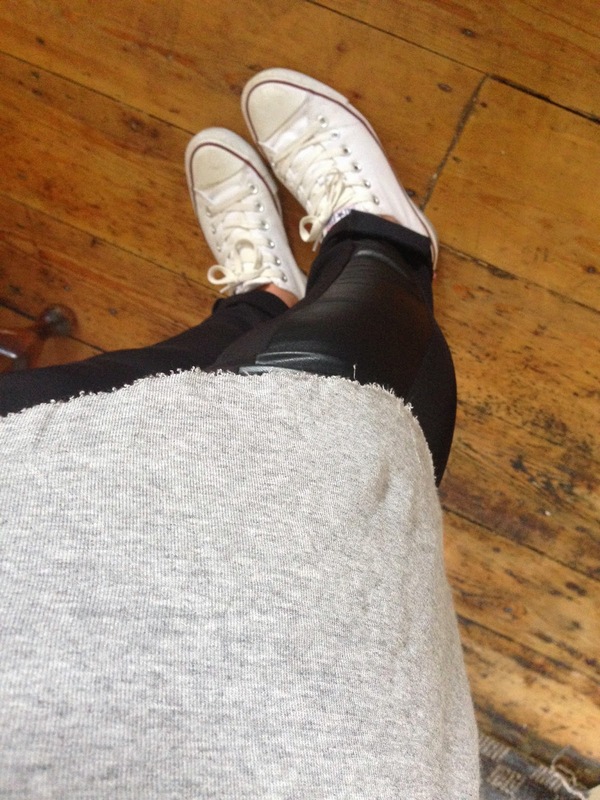 I could have worn a regular pair of leggings but I felt the PU panel just added that little bit of interest. 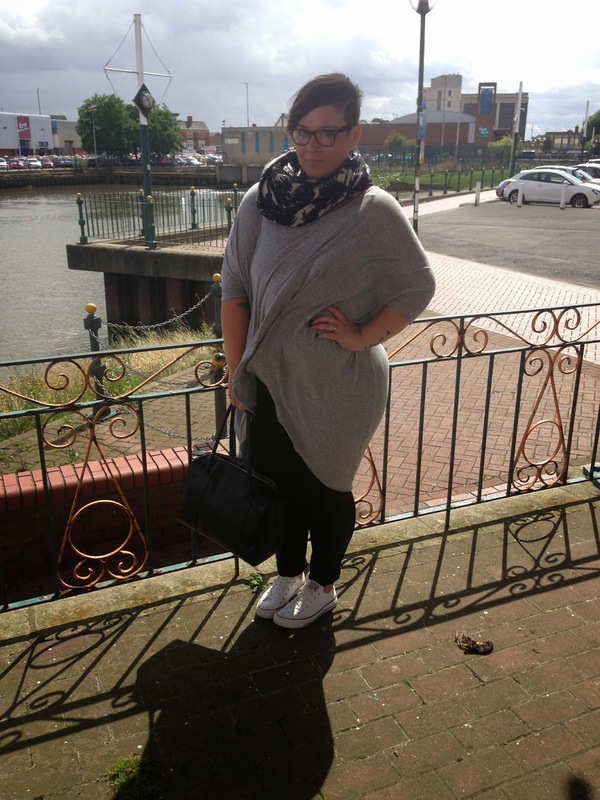 I kept it casual with my white Cons and added this fab loose grey top from ASOS (here in black), I finished the outfit off with this gorgeous scarf from Pieces (they have the best selection of scarves). As the weather gets chillier (yep, lets admit it) There's nothing I like more than lifting a simple outfit with addition of a scarf. I know I shouldn't say it, because I love the sunshine, but I am really loving the thought of rocking some autumnal outfits. Are you looking forward to cooler days and AW fashion? Becky, I love your style and I love how accessible it is for normal everyday people. 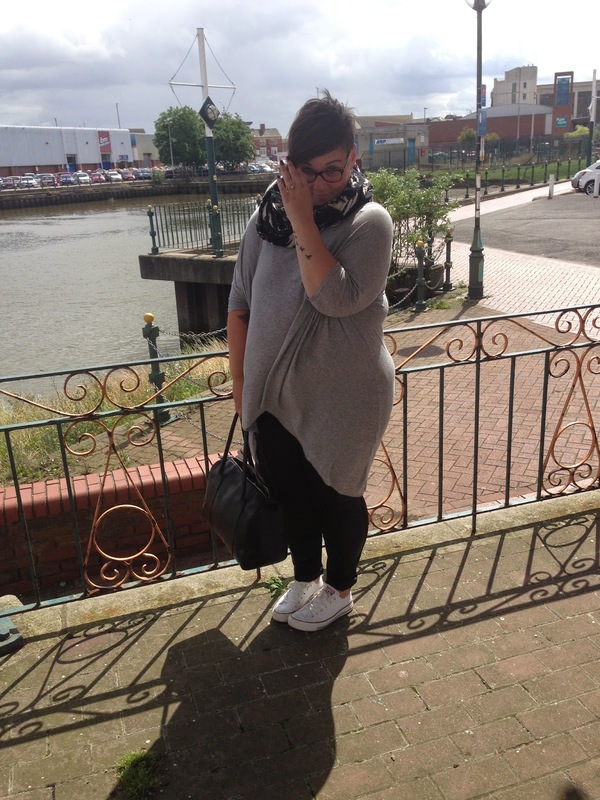 Shows how you can dress for a normal day but still look really stylish and pulled together. Thankyou for being such an inspiration!